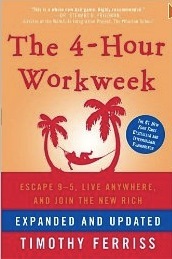 I just finished reading Timothy Ferriss's best-selling self-help book The Four-hour Workweek, first published in 2007. I found it to be a breezy, thought-provoking, entertaining and at times inspiring read. Ferriss's central thesis is that — surprise — you can have it all now, as long as you are willing to get creative about how to attain it. He begins by redefining what it means to be "rich." Traditionally we think of being wealthy as having some set amount of money, let's say 1 million dollars. But he argues that this is too simplistic of a definition. If you have a million dollars in the bank, but work twelve-hour days, bring your work home on the weekends, and don't ever get to spend time with your kids, how rich are you? Instead he says what we actually want is freedom and time to do the things we have always dreamed of doing — skiing in the Swiss Alps, tango dancing in Argentina, hiking the Inca Trail to Macchu Picchu. These are not unattainable goals, as long as we have the courage to restructure how we think about working hours and making money. He calls this becoming part of the "New Rich." To achieve these peak moments, he says all that we need is (1) a dream, (2) money to achieve it and (3) time to do it. After defining what it is that excites you, you need to figure out how to make enough money and free up enough time to achieve those goals. Ferriss's solution is to essentially outsource as much of your job as possible and find a steady source of income that doesn't require your active attention more than a few hours each week. I'm not going to go into how he proposes you do this, since frankly a lot of it was boring and irrelevant to me. There's entire chapters on hiring a virtual assistant, developing a product you can market that scales, and negotiating with your boss so you don't have to be in the office more than one day a week. Interesting, but not terribly pertinent to my situation. But I do think the central principal he proposes is compelling: find your passion and don't stop yourself from achieving it now. And the means to achieve this is beguilingly simple: earn enough money (well, more than enough money) expending the minimum amount of time, so that you can actually enjoy your passion on a regular basis. He suggests restructuring your life so that you can regularly taking off 1 month for every 2-3 months of work to do what excites you. It sounds kind of ludicrous until I realized that of course I know people who have lived significant parts of their lives this way. I.e. A couple that saved for four years so that they could take a year off and travel the world, during the worst recession in 20 years. A dancer who runs a very successful dance camp for three weeks that effectively funds his modest lifestyle the rest of the year. A Quaker that spends much of her life at various Quaker gatherings, conferences, and workshops around the US, supporting herself through proofreading and editing. A lindy hopper that runs a heavy equipment business who travels the world taking "business meetings," while also attending nearly all of the major swing events on the planet. None of these people are impetuous youngsters or independently wealthy. They simply have their priorities established and focused everything else on achieving those priorities. So the question for myself is, what excites me, and what would it take to ensure that on a regular basis I am doing the things that most excite me? The answers for me at this moment: I love to dance, eat wonderful and weird food, write stuff, and spend time with people that love and appreciate me. Not necessarily in that order, but ideally all in the same day. Luckily I live in a place where all of that is easily achievable. My move to the Bay Area was in Quaker terms "following a leading" without much knowledge of where that leading was going. I presumed that the leading would end up with some sort of socially beneficial cause to support or injustice to fight. But I don't really know anymore. Perhaps my path is simply to do the things that I am most excited about, make enough money to do that, and be confident that a more definite leading will present itself in due time. So going back to Ferriss's definition of being "new rich," I am surprisingly close to achieving my own definition of rich: dancing every night, eating yummy things, spending time with loved ones, and writing about the whole lot. It's all here in front of me. I am a very lucky person. How do we free ourselves from the ratrace of striving toward riches that in the end will mean nothing? Why is "hard, honest work" more important than time to pursue the things that we care about? Am I more than my job? These are really very Quakerly concerns. I don't have to agree with his answers to appreciate the examination. Conditions are never perfect. “Someday” is a disease that will take your dreams to the grave with you. Pro and con lists are just as bad. If it’s important to you and you want to do it “eventually,” just do it and correct course along the way…. It is quite possible—actually the rule rather than the exception—to have financial and time freedom but still be caught in the throes of the rat race. One cannot be free from the stresses of a speed- and size-obsessed culture until you are free from the materialistic addictions, time-famine mind-set, and comparative impulses that created it in the first place…. The Four-hour Workweek is available on Amazon and at a library near you. Check the official blog for more stories of becoming "new rich." Or not. Thanks for this post, Rik. I’ve had this book on my To Read list for too long. This will be my vaca read next week! Cool. I will curious to know what you think. I read this book and I have to say I am not a fan of the author or his debonair suggestions that we outsource our work. I do like the underlying message though! A book that really inspired me and with a very smilar but less annoying message is “Your Money or Your Life” by Vicki Robin and Joe Dominguez. I think you would like it too.